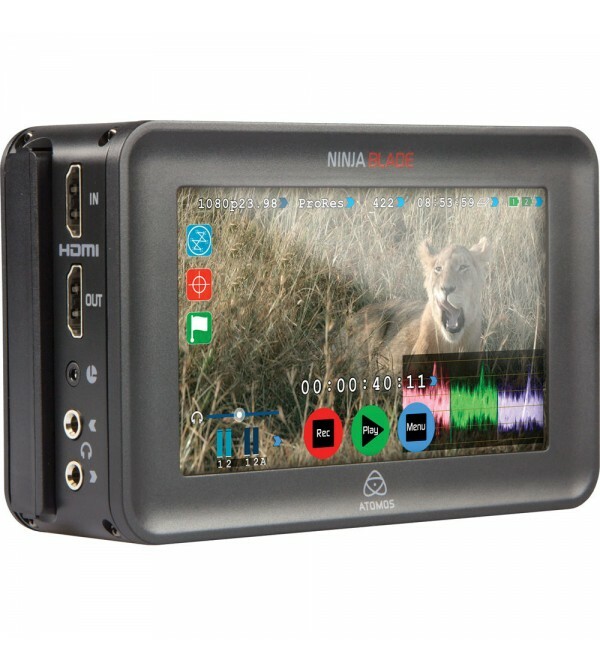 The Atomos Ninja Blade Video Recorder features a 1280 x 720 resolution display with 325 dpi providing a sharp image, in a small monitoring package. It records up to 1080 30p/60i resolution via HDMI to an available HDD or SSD using either Apple's ProRes or Avid's DNxHD codecs. Recording at 10-bit with 4:2:2 color sampling, this unit provides you a monitoring and recording solution in one compact battery powered unit. Blade accepts 2.5" HDDs/SSDs, which are sold separately. This is the full version, which includes a docking station that offloads these drives to your computer via USB 3.0/2.0. You also get a Sony-type NP-F570 battery, a charger, an AC adapter for continuous power, and two master caddies for available HDD/SSD It features two 1/4"-20 threaded mounting holed, one each top and bottom. 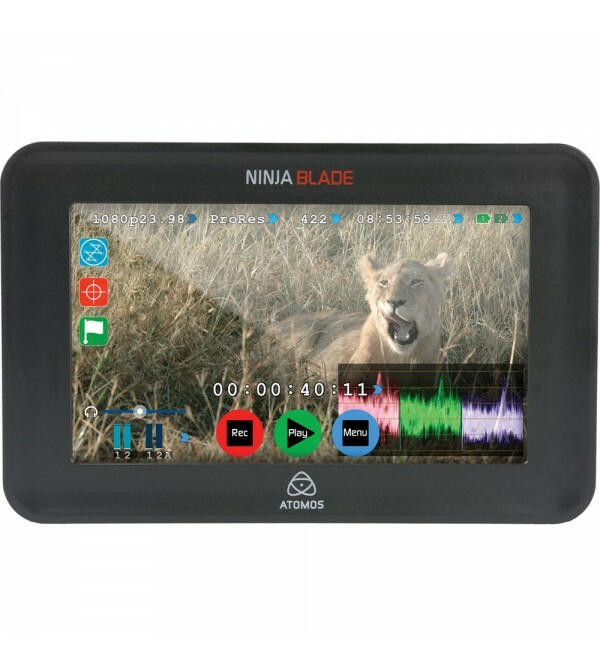 The Ninja Blade records directly from from the camera's video output, bypassing in camera compression, allowing the unit to record at 10-bit, 4:2:2 to Apple ProRes or Avid DNxHD. Blade's operating system, AtomOS, manages recording, playback, monitoring, and simple cut and tag editing via a capacitive touchscreen. AtomOS 5.0 supports alpha channel, transparency support, full waveform RGB and luma parade, and vectorscope with zoom. The Blade provides frame accurate timecode and start stop triggers over HDMI from many cameras, including Canon, Sony, Panasonic, Nikon, JVC, RED and ARRI. It also features LANC and rolling timecode trigger for those older cameras that don't have start stop flag protocols on board. The Blade additionally has tally lights to indicate start time. The unit encodes in your choice of Apple's ProRes and Avid's DNxHD codec and can also play back any ProRes or DNxHD file from any system, recorder or edit suite. You can take advantage of this playback capacity to take rushes on the road. It records to available 2.5" HDDs or SSDs, which are hot swappable. As SSDs are resistant to vibration they are ideal for shoots in rough conditions, such as on a race track. In case you accidentally pull the power or remove the storage drive while recording, the operating system will detect the disruption and will reconstruct your file to within 2 frames. All audio, even analog, is locked frame accurately to every video frame, never drifting or losing sync. If digital audio is out of sync from the camera, you can even adjust sync on the fly by advancing or delaying incoming audio. The Ninja Blade monitors/records 2 channels of audio embedded in the HDMI signal, and 2 analog audio channels. The Blade is built with aircraft grade aluminum and features locking mechanisms for each removable part. Blade consumes only 6W of power and can be powered by the included Sony NP Type battery. The unit features two locking battery slots, and comes with a Nikon EN-EL15 type battery adapter plate, and an LP-E6 type battery adapter plate, allowing you to use batteries other than the Sony NP type to power the unit.